Walks on the wild side. Forage, find, cook and eat with environmentalist Dr Rob Tilling. Identifying and gathering nature's bounty in and around Castle Bromwich Hall Gardens' 350year old acres of green. This week I planted out 40 Kale plants in the Batty Langley vegetable garden that have been quietly growing along in the greenhouse since September. We are trying three varieties, ‘Red Russian’, ‘Cavolo Nero’ and ‘Borecole – Green Curled Dwarf’. Kale does well over the colder months, so will hopefully add some interest in the garden over the following darker months. As pigeons take a fancy to stripping the foliage off plants in the Brassica family, the precaution of placing net over the kale plants has been necessary to stop them becoming just tattered stems! I have used two beds to grow the kale in, with 20 plants in each one, and to create a neat formal look the use of a tape measure was implemented to ensure even spacing. The botanical name for kale is Brassica oleracea var. acephala, ‘Brassica’ being the genus consisting of cabbages, ‘oleracea’ meaning that the plant can be used as a vegetable and ‘acephala’ meaning ‘without a head’, i.e that the plant is loose leafed rather than with a head as many cultivated cabbages have. Kale has a long history as a food crop, being one of the most important green vegetables in Europe up until the end of the Middle Ages. Our multiple charity day: You give – we give away. Our friend Trevor from Hosta Groundcare will lead our popular- Summer Baskets Workshop (£20). And, to celebrate Wimbledon; Some informal coaching from Pype Hayes tennis club coaches and a spot of croquet on the lawn too. This month we are delighted to welcome the award winning Indian takeaway specialists ‘Chutney Express‘. Based in Castle Bromwich, they have in just four years been crowned King of Curries in the West Midlands and been national finalists twice for the national Curry awards. Meet them and try some of their yummy food in our relaxed pop-up cafe. 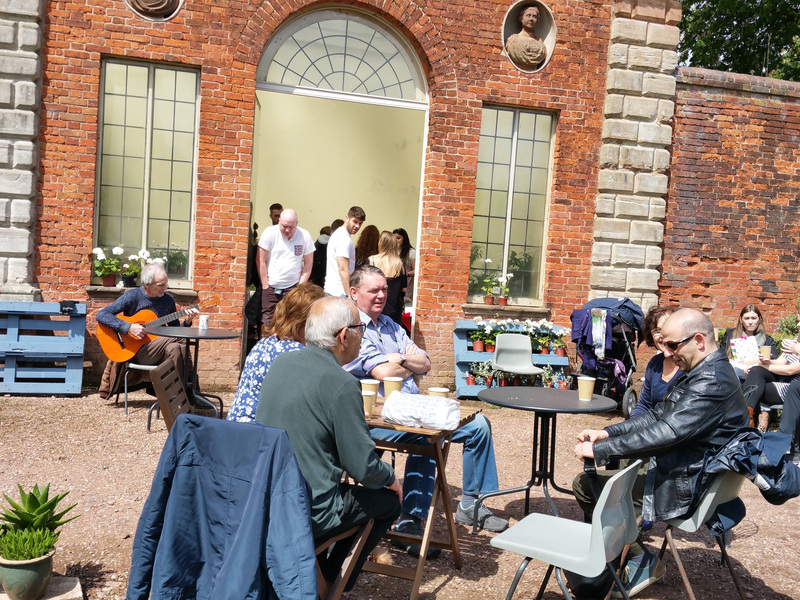 Dave – who is also one of our Garden guides, will be providing some gentle background guitar music too. Good prices, good food and good company .